This little bathroom is small, but so sweet. When we first began our house building plans, I heard several times to cut this third bathroom out of the plans, or at least the shower!, but I am so glad I stood firm. And for good reason, as the only other bathroom downstairs would have been the master bath. Guys! They just don't quite understand! (smile) I also joke that since I lived with one bathroom for several years in our previous house (and then went through a huge demo to add on another), I was all for adding plenty of bathrooms in this house from the beginning! I initially started in a different direction when decorating it, but it wasn't feeling at all right, so I changed gears and brought in some softer colors. Right now I am just loving this soft seafoam color and our guest room located across the hall from this bath has its walls painted in a similar shade. Although it was not at all necessary, it is kind of fun to think of having a guest room and guest bath decorated in the same color scheme. All the hardware in this bath - faucet, towel ring, paper holder and towel rack - is from the Pfister Tisbury line. I absolutely love this collection and its old world feel. Not only is it beautiful, but it is heavy and feels so durable. I've never had a single control bath faucet before, but what I've noticed with this one that I really like is that it has great water pressure and is so easy turning on and off. We went with the brushed nickel finish for all our baths - it feels a little more casual and pairs well with all the gray and blue tones we chose. We had a local cabinet maker build all of our vanities; all the cabinets in our house are the same shaker design with the same cabinet pulls and knobs. I love the cohesiveness, especially with our open floor plan. We put a towel rack in this bath so that guests can easily locate towels. 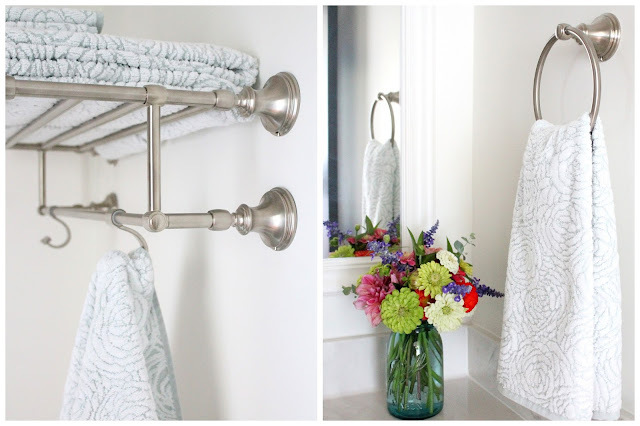 I also love the hooks for hanging wet towels or other items. If I missed anything you have a question about, just leave a comment! Your home is just beautiful. Are the walls and trim painted with satin? Thank you, Cindy! The walls are low sheen eggshell and the trim is semi-gloss. The bathroom is beautiful! I would have stuck to my word about the bathroom as well. No one wants guests in the master bath. I would love to have two bathrooms, but it will never happen unless we move. Thank you, Carol! I understand how it is living with one bathroom. :-) Having three bathrooms now feels like a luxury! Good morning:) my mom's adobe house in Colorado had the only bathroom in the guest room, I so remember that:). Having a guest bathroom is a smart choice and I love the colors and finishes in yours. 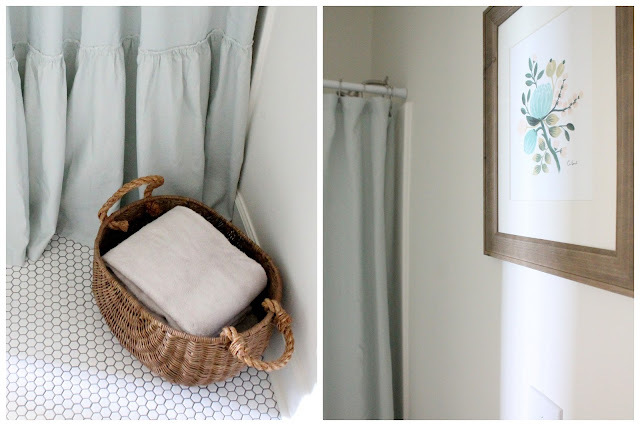 I love this sweet bathroom- the colors, the darling shower curtain, the baskets, the adorable flowers. Your attention to detail shines through. So eager to see more of your home tour. Much happiness in your new home!!! So sweet of you, Dana! Thank you! Thank you, Nelly! That is so kind of you to say. Seems like the walls are low sheen eggshell? 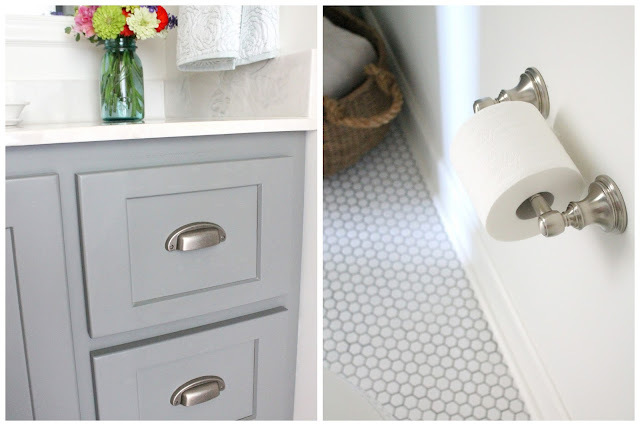 Despite it being a small bathroom, the use of neutrals/almost white colour and the gray cabinets makes for one fine combination. Painting bathrooms in lighter shades works great when you have a) limited natural light or b) smaller bathrooms like this one. However, your decor ideas and use of accents takes away attention from the size to the overall appearance of the bathroom - which is fantastic! Thanks for sharing the names of paint colours and other accessories below the pictures. Good work! Steven.